Underground tunnels have been part of London’s story for nearly 200 years. The 1843 opening of the Thames Foot Tunnel, built using using Marc Isambard Brunel’s and Thomas Cochrane’s newly invented tunnelling shield technology, by Brunel and his son Isambard Kingdom Brunel, marked the beginning of a boom in underground construction that has continued to the present day. The Tube, the world’s first underground railway, Sir Joseph Bazalgette’s sewers, the now disused Post Office Railway and other essential services have all helped to make London one of the most excavated cities on earth. Building the tunnels is a key part of Crossrail’s story and over the past three years it’s been happening right beneath your feet. Between 2012 and 2015, eight 1,000 tonne tunnelling machines bored 42km or 26 miles of new 6.2 diameter rail tunnels under London. The machines were operated by “tunnel gangs” of 20 people, working in shifts around the clock to construct the tunnels, carving out around 3.4 million tonnes of earth. Teams of dedicated miners worked 24 hours a day to complete the tunnels for Europe’s largest civil engineering project with thousands of others employed to upgrade the existing rail network and build major new stations in central London and Docklands. The tunnels weave their way between existing underground lines, sewers, utility tunnels and building foundations from station to station at depths of up to 42m. 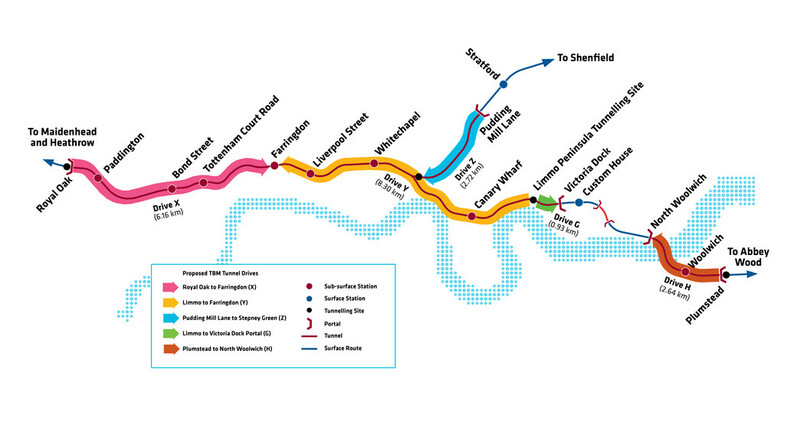 Find our more about Crossrail’s tunnelling marathon.